tortaszelet és rajta 1-es gyertya sem maradhatott el. Tényleg nagyon köszönöm nektek ezt az 1 évet, a következő évben még több bejegyzést szeretnék írni! Remélem tetszett ! Hey guys! 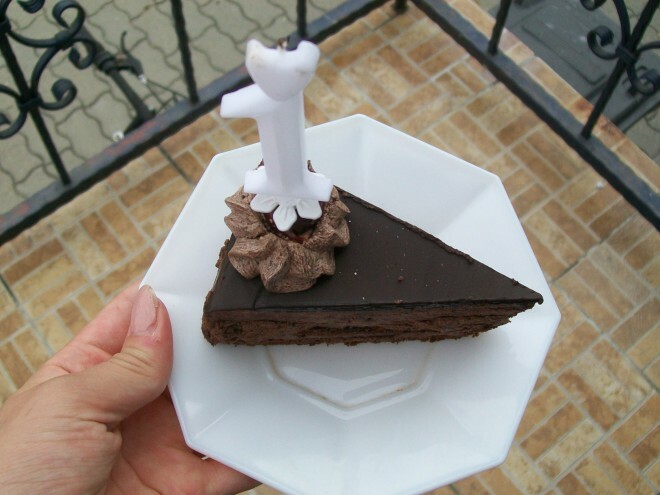 My blog turned into 1 year old today! I'm so happy and thankful! Thank you for those who have been reading it, I hope you will be here in the next 10 years! It's so weird that 1 year is over from the first post /Link/. I really can't be thankful enough! Unfortunately, today was a bit rainy in the morning, but it has stopped, so we could have taken an outfit picture. My black platform shoes is always a great choice with my "blue" denim. And maybe my favourite part in the outfit is the top, with pink collar and three-quarter sleeves. I thought it's a birthday, so the cake and the candle with the 1 couldn't be left out. I really thank you this one year, more posts want to be writen in the following years. I hope you liked it!